Aaron Wolf made this digital print titled, "Queen of the Dead". It is a limited run of 12 signed and numbered prints." They are available to order through his blog. I know this is a little delaying on posting, but if you would like to purchase a print, they are still available on his site. I'm glad the guys saved this one. It's as if it was meant for me to post. I love the use of colors, which are some of my favorite summer colors. The doe eyes, pouty lips and long hair really work well with the anatomical nature of the skull. It reminds me of a black and white skull that I've done, but Aaron's is definitely more vibrant. I also recommend looking through his other pieces on his blog. 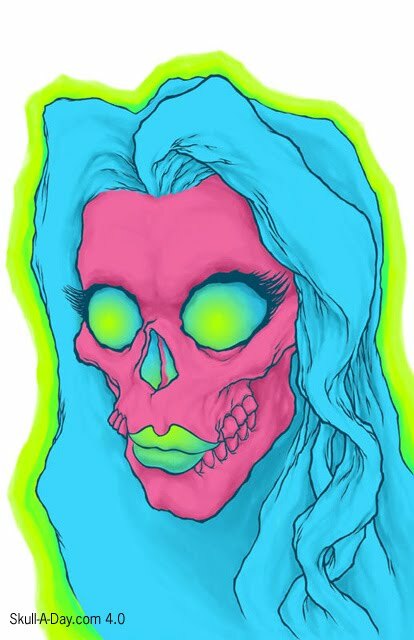 He has many delightfully creepy digital art pieces.